Anna Blume is writing a letter to someone back home. She writes about the things that have happened to her since she arrived in an unnamed city, searching for her brother. It's the end of the world here, she knows no one, and she can't find her brother. People are dying in the streets, either murdered for their resources or finally giving up on a better future. Can Anna escape the city or will she join forces with another person in order to survive? I read Auster's Oracle Night and really enjoyed its magical realism and multiple narratives. I happened to pick this one up, but it's wildly different from his other writing. This book is sparse and terrifyingly real. In this city (which seems like NYC, but is never named), almost no one has a job or a permanent place to live. People with more strength or better weapons can force you to leave your home at any moment. Citizens simply wander the streets, looking for relics of a better time that they can sell for food money. Babies haven't been born for a long time, and the population is dropping rapidly. People are truly desperate as they look for ways to end their miserable lives. Some hire an assassin to take their lives, some pay their last few dollars to be euthanized in a posh clinic, and some train for months to run until their hearts give out. The darkness and desperation of these people permeate the pages of this book. Anna is an interesting narrator, although as she admits, everything she says is suspect because no one knows what to believe anymore. One of the most striking things is her realization that things just cease to be - one day a street is there and then gone, a person is alive and then dead, entire words and concepts are leaving collective memory. "When you live in the city, you learn to take nothing for granted. Close your eyes for a moment, turn around to look at something else, and the thing that was before you is suddenly gone. Nothing lasts, you see, not even the thoughts inside you. And you mustn't waste your time looking for them. Once a thing is gone, that is the end of it." This is a good book, but it suffers from dystopian syndrome. While this book was written 25 years ago, it seems that today everyone and their mother has written a novel about the end of the world. So why should you read this novel about the end of the world instead of the thousands of others? 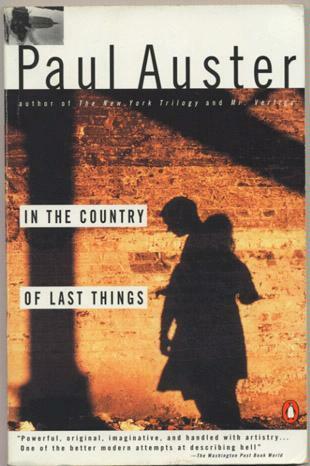 Auster utilizes a lot of things that seem familiar to people who regularly read dystopian stories, but he does it with a level of perception and insight that makes other books pale in comparison. This is a short book, but it is one to be read slowly and carefully. In Auster's capable hands, the end of the world seems terrifyingly plausible. Considering another book by Paul Auster? Here's my review of Oracle Night. I don't know what this says about me but that sounds like a great read. I am really getting into dystopian fiction at the moment. I would love to read something like this that has a real edge to it. I think this one might be a great choice for you! It's interesting to read as one of the first novels of this type and I think the insular focus on Anna makes it different from a lot of dystopian novels that revolve around a group of people or a community. It makes it that much scarier, because she is basically alone at the end of the world. It's Monday and boy, it's been a week! It's Monday and it's almost Thanksgiving! It's Monday and my best friend is here! It's Monday and the power is back on!